The FOMC meets next week, and some form of quantitative easing (QE2) program is anticipated. This Wall Street Journal article reflects the view that this will be a "measured" approach, i.e. "a few hundred billion dollars" in purchases of 2 to 10-year Treasury securities over several months. The article quotes publicly available sources - mainly published speeches by Bernanke and Fed Presidents, so there is not much in the way of specific new information. The "measured" approach is consistent with remarks made by Jim Bullard, in post-dinner talk at this conference. Jim is on record here as being concerned about deflation, with QE2 part of the remedy. In his remarks last week, he said (and you have to trust my memory here) that, in his opinion, quantitative easing should proceed much as traditional FOMC decisions about fed funds rate targets have. He thought QE should proceed a bit at a time, with re-evaluation of the program at each FOMC meeting, which certainly seems to be consistent with what the WSJ is anticipating. 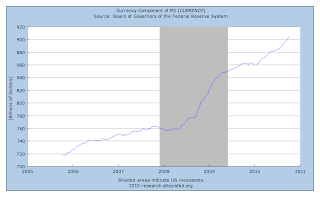 Given that the Fed is going to do QE2, I think the gradualist approach is appropriate. We have no well-established theory for understanding what the effects of QE2 will be (though Kocherlakota does a nice job here of laying out the issues), and no practical experience that will help us forecast the quantitative effects. Further, I think there is significant upside inflation risk (though I know a lot of people don't agree with me). The stock of currency is increasing at a higher rate recently, the US dollar is depreciating, and some commodity prices are increasing at a high rate. Of course, some of what we are seeing (for example higher "break-even" inflation rates implicit in bond yields) can be attributed to anticipated easing by the Fed, but I think the Fed would be correct in being concerned about the potential for more inflation than what we would like. This is the first sensible piece of accessible writing I have seen on the "global imbalance" issue. This piece by David Andolfatto is the second. My thought for this morning is that, in recent memory, the United States has not embarked on a fiscal program that asked sacrifice from anyone. Politicians either tell us that we can tax the very rich to solve the problem, so don't worry about it, or we can cut benefits to the very poor, so don't worry about that either. Some economists tell us that there is a Keynesian free lunch that cures recessions, and we don't really need to be concerned with the future consequences of higher deficits today. Maybe we're not very good at marketing pain, or sharing it. A chicken model is constructed in the following manner. Assume that consumers like chickens, and also that the private sector cannot produce chickens, but the government can. Therefore, it would be efficient for the government to produce chickens. Randy Wright tells me (confirmed by Richard Rogerson) that this parable originates with Ed Prescott. The trick in any serious policy analysis is to write down a coherent economic model with a role for the government that is not a chicken model. We have all seen chicken models from time to time. My favorite is IS/LM, where the "chicken" is price flexibility and/or wage flexibility. Someone drew my attention to this book review by Robert Solow. It's a very thoughtful piece on economics, efficiency, and market failures. I like the bottom line, which is that there are no easy answers. In most of the public statements by Fed officials I have seen recently, there is little talk that is not leaning towards some type of second-round quantitative easing program (i.e. "QE2"). However, no one in power is saying much about how large these upcoming purchases of (presumably) long-term Treasury securities by the Fed will be. 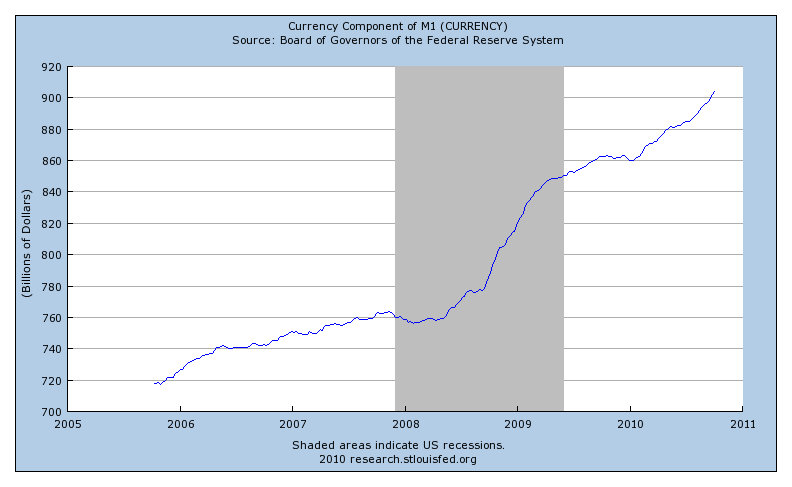 Of course, you can find plenty of speculation outside the Federal Reserve System about he size of QE2. The New York Times editorial page writers think that the purchase should be at least $1.7 trillion. These people survey some economists, who think the intervention will be in the range of $500 billion to $1.25 trillion. This guy, who's including the asset purchases required to replace the mortgage-backed securities which he is assuming run off at a faster rate, says $3 trillion. Maybe these people are just blowing hot air, but maybe they know something I don't, in which case this seems quite disturbing. Suppose I do the following mindless calculation. Assume the Fed wants 2% inflation per year, which requires an increase of maybe one percentage point in the inflation rate. The monetary base in the US is currently $1.96 trillion, so suppose therefore that I want this to increase by 1%, or 19.6 billion over the next year, which if this translates directly into inflation, gives me the extra 1% I want. This implies that QE2 could involve something like a purchase of $19.6 billion in long Treasuries over a year, or about $1.6 billion per month. What are these people thinking? Since China is so much in the news, it seems useful to understand how the Peoples Bank of China (PBC) operates in the context of Chinese financial markets. The PBC of course has a web site, and this is what its balance sheet looks like. Note that the asset side of the balance sheet is dominated by foreign-currency-denominated assets. About 80% of assets is "foreign exchange," which I'm assuming is mostly US Treasury securities. Another key feature, on the liabilities side is about 4.7 trillion Yuan (I think I have my units right) in "bond issue." These are PBC bills, which are interest-bearing securities issued by the central bank. The PBC uses PBC bills as part of its fixed-exchange rate strategy. To support an essentially fixed exchange rate with the US, the PBC has had to purchase foreign exchange, and it typically "sterilizes" (strange word - anyone know where this comes from?) this - by issuing PBC bills rather than outside money. Note that the stock of "claims against the government" on the asset side of the balance sheet of about 1.6 trillion Yuan. When operating under a fixed exchange rate, a central bank typically can't sterilize forever, as it runs out of interest-bearing domestic-currency-denominated assets to sell. However, the PBC is not constrained by that bound, as the central bank can issue its own interest-bearing liabilities (PBC bills), which are presumably less liquid than reserves. There are of course issues about sterilization. With well-integrated financial markets this has to be a losing battle, but with China there are enough internal and external financial restrictions that this could work. However, apparently it has not, as most monetary quantities in China are growing at rates in the neighborhood of 20% per annum, and the inflation rate is running at about 3% per year. Now, as was widely reported yesterday, the PBC "increased interest rates." If you thought this was something equivalent to raising the fed funds rate target (in normal times), you would be wrong. The PBC increased the one-year "deposit rate" and one-year "lending rate," by 25 basis points each, to 2.25% and 5.56%, respectively. As this makes clear, there were related announcements about interest rates on deposits and loans of other maturities, where the rate increases were different. These deposit and loan rates are the interest rates of financial institutions. The banking system in China is dominated by a few state-owned banks, and these PBC-administered interest rates appear to effectively be deposit interest rate ceilings and loan interest rate floors. Interest rates in some financial markets in China are supposedly unregulated, but this piece makes it clear that, for example, interbank lending rates are driven primarily by rates administered by the PBC. Was the PBC move yesterday a monetary tightening? This is complicated, as we are dealing here with a central bank that is not independent of the government, which also effectively runs much of the financial system. Part of the motivation for the interest rate increases seems to be a kind of disintermediation phenomenon, not unlike what occurred in the 1970s in the United States when there were deposit interest rate ceilings and high inflation. There are few vehicles for saving in China for private individuals, other than savings deposits and housing. Given higher rates of inflation, deposits are earning negative real rates of return, which makes investment in housing look very good. If all interest rates go up, what does this do? Deposits at banks become more attractive and, to the extent the loan interest rate floors are binding, borrowing becomes less attractive. Banks can of course park extra deposits in US Treasury securities. Apparently they do a lot of that already. Presumably the result is a net increase in the demand for outside money, which we would think of as a tightening effect of monetary policy. Currency becomes less attractive and the demand for reserves rises due to binding reserve requirements in China. Ultimately, though, we could think of this as involving no change in the PBC's policy stance, relative to a time when the inflation rate was lower. These changes in administered interest rates can be viewed purely as making the Irving-Fisher adjustments (though probably incompletely) that the market would be making if it were allowed to. I spent the weekend in Toronto, which was something of a respite from the conflict and anger that is roiling in the United States of America. In Toronto, construction (both residential and non-residential) is apparently booming, nobody is angry with the banks (none of which were bailed out or failed during the financial crisis) or with politicians (more than is normal), and the peoples of the world appear to be living together in Toronto with a high degree of tolerance for each others' different habits. Note that Krugman is careful here to use the term "economic warfare." However, it's hard to draw the line between economic warfare and actual guns-and-bullets warfare. The United States, being a "major economic power" has hardly been hesitant in the past to use force to further its own economic interests. One could view the Cold War as a fight by the US to curtail the economic power of the USSR, which threatened the economic power of the US. The United States continues to bully Cuba with an economic embargo, in spite of the fact that Cold War issues were resolved long ago. United States incursions into the Middle East in an attempt to secure oil supplies are of course well-known. You can ask the Canadians about "economic warfare" with the United States. In spite of NAFTA, the US periodically picks a fight with Canada over some trade issue - lumber, for example. One rarely hears about these issues in the US media, but Canadians are well-aware of them. Here we have the pot calling the kettle black again. I'm sure the United States has never subsidized a domestic producer or encouraged a foreign company to locate here - in your dreams. While I'm sure many Americans want to view the United States as representing the forces of good in the world, there are many instances in modern history when the US has been seen in the rest of the world as the rogue economic superpower that sets the rules. The rules that Krugman wants China to play by are US rules, set up to serve US interests. As I have argued elsewhere (here and here) the attempt to force China into intervening to cause its currency to appreciate is misguided. I'm not sure what Krugman has in mind in the last sentence of his piece (above), but I think that the United States has to become accustomed to the idea that its relative power (and possibly absolute power as well) is waning. Even if China is ultimately a bully, the US has to live with it. But, take heart. Through its entire existence, Canada has lived next door to a bully, and it seems to do fine. Bernanke's speech at the Boston Fed today provides a useful summary of current attitudes on the FOMC, and essentially encompasses what was in the last published FOMC minutes. The interesting parts have to do with Bernanke's views on the forces propelling inflation, the current policy choices facing the FOMC, and the tools that are available to the Fed currently. Bernanke's view of policy choices is framed here in Phillips-curve language. According to him there is a natural rate of unemployment, which he calls the "long-run sustainable rate of unemployment" and, much in the way Friedman thought about the Phillips curve in 1968, there is "upward or downward pressure on inflation," depending on whether the actual rate of unemployment is, respectively, lower or higher than the natural rate. Now, as Bernanke recognizes, this natural rate of unemployment is very hard to measure. Further, as Richard Rogerson has argued (as David Andolfatto reminds us in this blog piece) it would be a good idea to eliminate the terms "natural rate of unemployment," "structural unemployment," "demand-deficient unemployment," etc., from our vocabulary entirely. What does Bernanke mean by "long-run sustainable unemployment" anyway? Is this the unemployment rate that we would see in the absence of any long run factors such as sectoral demand and productivity shifts, or short run factors affecting the unemployment rate? If so, how could this concept be useful in formulating policy? Basically, there is always something going on. We are constantly faced with long run and short run changes in exogenous factors that affect the unemployment rate. The key question is whether some intervention by the Fed will improve economic efficiency or not, and occupying your mind with thoughts about some natural rate of unemployment will not help in answering that question. The longer-run inflation projections in the SEP indicate that FOMC participants generally judge the mandate-consistent inflation rate to be about 2 percent or a bit below. Several rationales can be provided for this judgment, including upward biases in the measurement of inflation. A rationale that is particularly relevant today is that maintaining an "inflation buffer" (that is, an average inflation rate greater than zero) allows for a somewhat higher average level of nominal interest rates, which in turn gives the Federal Reserve greater latitude to reduce the target federal funds rate when needed to stimulate increased economic activity and employment. A modestly positive inflation rate also reduces the probability that the economy could fall into deflation, which under some circumstances can lead to significant economic problems. The upward-bias argument has to do with the well-known upward bias in CPI measures of inflation. The inflation buffer idea seems to go as follows. Inflation is costly, and variability in inflation is also costly, as it creates uncertainty. The way the Fed controls inflation is by moving the fed funds target around in the short run - up if inflation is too high, down if inflation is too low. If the average inflation rate is low, then the Fed will find itself frequently at the zero lower bound on the nominal interest rate and unable to increase inflation when it is too low. Thus, inflation is on average low, but too variable. By having a higher average inflation rate, inflation can be less variable. Of course, the Fed appears to be currently on the verge of attempting to increase the rate of inflation through other means than lowering short-term nominal interest rates, which are currently essentially at the zero lower bound. Indeed, later in his speech, Bernanke indicates that he has some confidence that the Fed can pull this off. What's the problem with the zero lower bound then? The last argument Bernanke makes for a 2% inflation rate is that this is sufficiently far from zero that we won't fall into a deflation. This reflects the view that deflation is somehow an absorbing state, and a bad one at that. However, deflation need not be absorbing, and much theory tells us it is actually a good state to be in. We actually do not have a theory that tells us why deflation is bad. Basically, Bernanke cannot really tell us why the inflation rate should not be -1%, 0%, 4%, or even 10%, rather than 2%, and neither can I. Of course, it is hard to argue with the idea that a predictable rate of inflation is a good idea, and 2% inflation certainly seems at least as good as anything else. Now, as to what the Fed should be doing currently, Bernanke makes it clear that he thinks the Fed is achieving neither of the goals in its dual mandate. From his point of view the unemployment rate is too high, and the inflation rate is too low. Thus, if we have a Phillips-curve view of the world (which tends to promote agreement among inflation hawks and inflation doves) there is no conflict. Monetary policy should somehow be less restrictive. But how? Bernanke talks about two approaches: (i) purchases of long-maturity assets; (ii) statements about future policy actions that will alter inflationary expectations. In the first case, sometimes referred to as QEII (quantitative easing, second part), note that Bernanke is not clear about whether these purchases might be long-term Treasury securities or mortgage-backed securities. I'm not sure if this is an important policy statement, but it certainly seems at variance with most public statements by Fed officials I have seen, which make it clear that QEII, if it happens, will be purchases of Treasury securities. 1. Bernanke seems to think that all of the inflation risk is on the downside. I'm not sure that this is correct. While essentially all measures of inflation give a current inflation rate in the neighborhood of 1%, year-over-year, there are some signs that we could be due for more inflation, even if the Fed does not change its stated policy. First, the producer price index has been growing at a year-over-year rate of from 5.5% to 9.0% since January 2010. Second, consider the recent behavior of two monetary quantities, the currency component of M1, and total M1 (you'll see similar patterns in other aggregates) in the first two charts. The rate of growth in currency has picked up significantly recently, and you can see a recent increase in the growth rate of M1 (these are weekly numbers). You can see a similar pattern if you look at M2. Thus, if you are an Old Monetarist or a New Monetarist, you might be expecting more inflation. Further, if we look at the difference between yields on 10-year nominal Treasury bonds, and 10-year TIPS (the "break-even" inflation rate implied by Treasury bond yields) in the next chart, note the recent history in the monthly data. 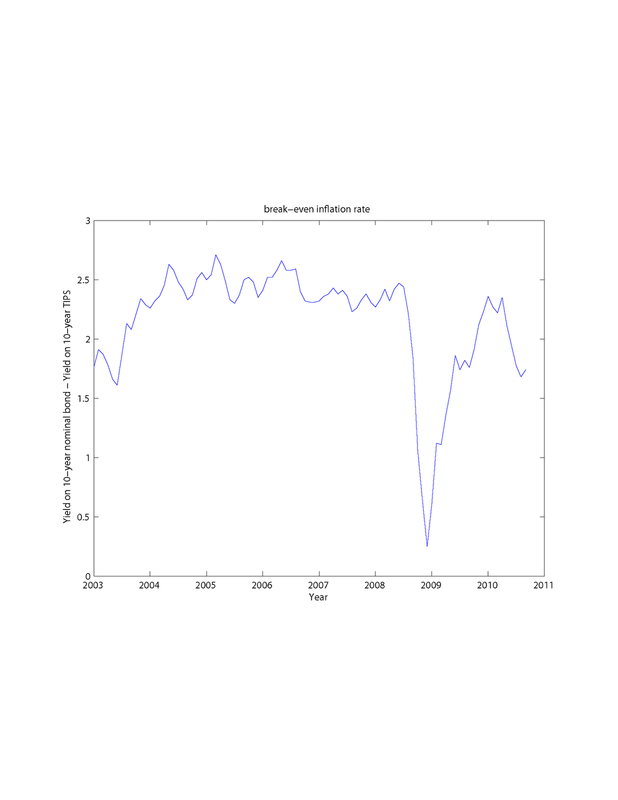 Now, in the last few days, the break-even rate has increased significantly, to 2.13% (the last time I checked today). While this recent increase is likely due to what the FOMC is expected to do at its next meeting, this perhaps indicates a need for caution. To address such concerns and to ensure that it can withdraw monetary accommodation smoothly at the appropriate time, the Federal Reserve has developed an array of new tools.7 With these tools in hand, I am confident that the FOMC will be able to tighten monetary conditions when warranted, even if the balance sheet remains considerably larger than normal at that time. These "tools" are term deposits and reverse repurchase agreements, which the Fed appears to view as "reserve-draining tools," which it can somehow use to forestall inflation without raising short-term nominal interest rates. I think this notion is wrong. Whether reserves are held overnight or as term deposits, the Fed has to provide sufficient inducement (i.e. a high enough interest rate) for banks to hold a given quantity of reserves. If the Fed wants banks to hold more reserves, it will have to raise the interest rate on reserves. There is no getting around that. If the Fed wants to do reverse repurchase agreements, it might as well be selling assets. These "new tools" are not new in any sense. They are just other names for things that the Fed is already quite capable of doing. Finally, Bernanke seems to be quite concerned with clear communication between the Fed and the public. Two good ways to start would be: (i) Drop the discussion of funny new tools like term deposits and reverse repos; (ii) Let us know what the Fed intends to do with the $1 trillion plus in mortgage-backed securities on its balance sheet. If we are in a phase where quantitative easing in some form is going to be on the table, we have to have some idea of what the Fed intends to do with the quantities on its balance sheet, under particular contingencies. There has been a lot of fuss recently about exchange rates - the relative prices at which currencies trade on foreign exchange markets. I find the whole issue very puzzling, and this is my attempt to sort this out. Let's start at the local level. In the United States (and probably in other countries too), there is a local currency movement. The most prominent (and on some level, successful) example is Ithaca hours. In Ithaca, New York, a group of what are apparently local merchants issues pieces of paper, with the members of the group agreeing to accept this currency in exchange for goods and services. The unit of currency is an "hour," and the exchange rate of hours is fixed (apparently by decree) at 1 Hour per 10 U.S. dollars. Apparently these notes are not redeemable in anything, in contrast to private currency systems that existed historically, for example before the Civil War in the United States. It is not clear who gets the seigniorage (the initial benefit from the issue of the currency), but I'm guessing that, if one signs up as a member, one gets in return some quantity of hours to spend. What motivated these Ithacans to start up their currency system? This (I guess we would call it a graphic short story) tells us. Note in particular points 1 through 7 starting in the middle of the page. It should be clear that the hours-issuing Ithacans did not attend classes in conventional modern economics. The theory underlying their currency system is in part related to social credit and Marx's labor theory of value, with some wishful thinking thrown in for good measure. The wishful thinking relates to the ideas that exchange using hours can somehow enforce a minimum wage of $10.00 per real hour (i.e. there is Ithaca hour illusion), and eliminate cutthroat capitalism, thus making the economy somehow more friendly. However, for later use, note three key ideas in their story: (i) money is not neutral: more units of it in circulation increases local employment; (ii) there is a protectionist element: form a local club, which promotes trade among members of the group, the corollary being that there is less trade with the rest of the world. Now, going beyond the local level, historically governments were motivated to establish national currencies in part to generate revenue. If it is very costly or impossible to collect taxes to finance government spending, it can be efficient for a government to establish a monopoly over the issue of money. The government can then exploit this monopoly power, particularly in wartime, by printing money to finance its expenditures. However, the establishment of a national currency could be motivated by some of the same ideas that got the hours-issuing Ithacans excited. If a government can successfully establish its currency as the most widely-accepted medium of exchange within its borders, this serves a protectionist role, in that it makes exchange between domestic residents and the outside world difficult. To export or import goods requires that I convert domestic currency into whatever medium of exchange is used outside my own country, and the government can make this even more difficult by throwing sand in the gears of the foreign exchange market. It is this idea that motivated the formation of the European Monetary Union, under which the medium of exchange in most of Europe became the Euro, thus lessening frictions associated with trade in goods among European countries. 1. There are global "imbalances," i.e. 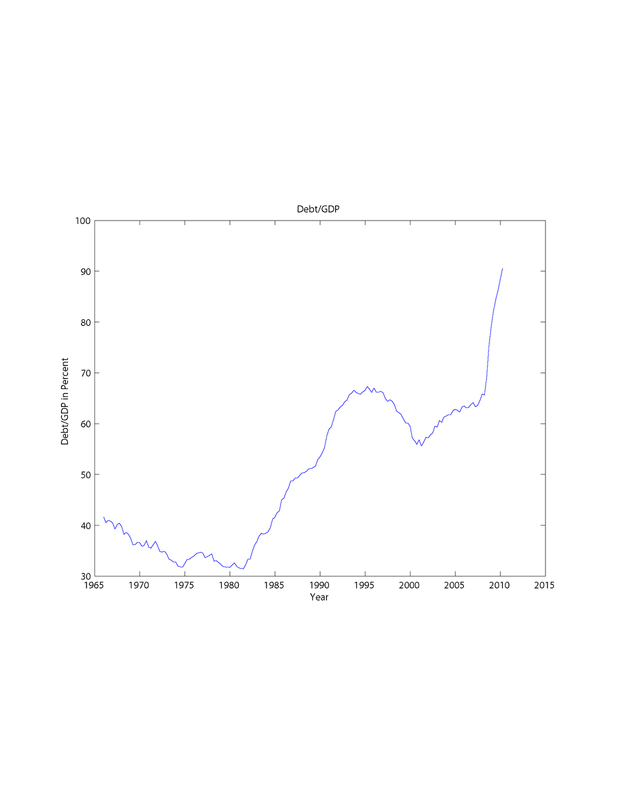 some countries are running current account surpluses (e.g. China and Germany), and others are running current account deficits (e.g. the United States). 2. The way to cure these imbalances is to have the exchange rates of the surplus countries rise, and those of the deficit countries fall. 3. To the extent that surplus countries engage in policies that prevent exchange rate appreciation, this is bad for the world, as it perpetuates the imbalances. What happens when a country runs a current account surplus? Roughly, it is selling more goods and services to the rest of the world (exports) than it is buying from the rest of the world (imports). The rest of the world has to be paying for this net outflow of goods and services with an inflow of assets to the surplus country. A country with a current account surplus is effectively accumulating claims on the rest of the world - it is a net lender in the world economy. Similarly, a country with a current account deficit is a net borrower in the world economy. Now, there are plenty of good reasons for a country to be running a current account deficit and borrowing from the rest of the world. First, a country may have a period when its productive capacity is temporarily low. For example, there could be a widespread crop failure, and it can then make sense to borrow temporarily from the rest of the world to finance imports of food. 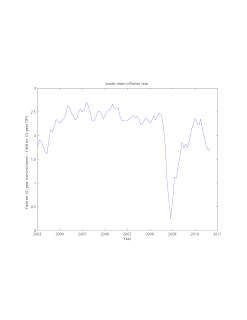 This is the consumption-smoothing motive for a current account deficit. Second, a country may have high-return domestic investment projects, and there may be insufficient domestic savings to finance that investment. A country can borrow on world markets to finance the investment projects, and effectively repay the loans in the future when these projects pay off (when the country will be running a current account surplus). This is the borrowing-for-investment motive. Third, a country may choose to finance government spending by issuing government debt to foreigners. Indeed, this may be an efficient method of financing, relative to the alternatives. This is the government-borrowing motive. Since there are at least three good reasons for running a current account deficit, there are also at least three good reasons for running a surplus, and we can imagine an efficient state of affairs where the countries of the world are never in "balance," where balance is a state where the current account surplus is zero in all countries. Just as with particular households, where there is an ebb and flow to borrowing and lending and the quantity of debt over the household's lifetime that allows it to deal with fluctuations in income and investment opportunities, so it is with countries. What are Treasury Secretary Tim and the IMF all wrought-up about then? Possibly what they have in mind is that current account surpluses and deficits appear to be quite persistent. 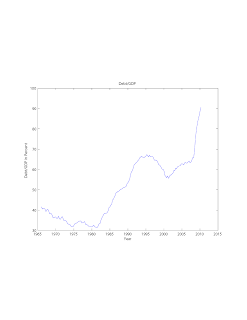 For example, the United States has run a current account deficit for most of the period since the early 1980s. Possibly the holders of the debt of deficit countries will ultimately come to doubt that these countries are capable of paying off their current stock of debt (as has already happened to some countries), and creditors will demand high premia to lend to these countries or well cease lending entirely. If this is the case, the "imbalance" problem solves itself, through the actions of international lenders. But maybe this solution is too costly. Sovereign debt problems (as in the recent case with Greece) develop suddenly, and entail potentially severe short-term disruptions. Another potentially less costly approach for a country that is having trouble servicing its debt is to implicitly default. This can be accomplished through monetary expansion. An easy monetary policy increases domestic prices, thus reducing the real value of the government's debt in terms of domestic goods, and the exchange rate tends to depreciate. No matter what foreign governments do, the deficit country's debt is worth less in terms of foreign goods as well. Of course the long-term cost of implicit default is that international lenders will now trust you less - keep inflating away your debt, and you pay a high premium on world credit markets, so there is really no easy way out. Now, the way the current "imbalance problem" is framed, by Geithner for example, is as if the problem of the US as a debtor nation was created by the thrifty habits of the creditor Chinese. Further, the problem is almost always described in terms of the relative prices of goods on international markets and the effect of those prices on the current account balance. This seems odd, particularly as the pattern of current account balances across countries is best explained in terms of how credit markets work domestically and internationally. From Geithner's point of view, a current account surplus implies that the relative prices of goods are somehow wrong. China is selling us too much stuff and buying too little of our stuff, according to Geithner, and the solution to this problem is to increase the relative price of the stuff that China sells relative to the price of stuff that China buys. What better way to do that than to have China allow its currency to appreciate? This makes no sense. Suppose, for example, that we had balance of payments accounts by state for the United States. Suppose that those accounts indicated that California was running a persistent current account surplus relative to New York. Would we think it a serious problem that exchange rates are fixed within the United States, and argue that a solution to our "imbalance problem" is to have individual state currencies, so that we could allow the California currency to appreciate relative to New York currency? The ideas motivating Geithner seem as misguided as, and indeed are similar to, those motivating the issuers of Ithaca hours. The surprising thing is that the issuers of Ithaca hours have never contemplated a devaluation, which according to Geithner logic would steal jobs from Syracuse, Elmira, or possibly Binghamton. Of course this would lower the minimum wage in Ithaca, according to this, which may explain why this has not been attempted. This year's Nobel Prizes in Economics went to Peter Diamond, Dale Mortensen, and Christopher Pissarides, for their work on the economics of search. Excellent choice! This work has been highly influential. Diamond developed an early Keynesian coordination failure model in a search framework, and the Mortensen-Pissarides model has become a workhorse in labor economics and in modern macroeconomics, changing entirely how we think about labor markets. Search has also been used extensively in monetary economics, at least since the late 1980s. It's hard to imagine what economic research would look like today without the work of Diamond/Mortensen/Pissarides. What do Post-Keynesian Economics, Austrian Economics, Institutional Economics, New Institutional Economics, and Marxist Economics have in common? People working in these areas sometimes call themselves Heterodox economists, and they work on the fringe of the profession. On rare occasions I have dipped into what these people do to find out what it is about. Typically, what I find is a grumpy bunch who dislike mathematics, and whose aims are mainly destructive - they want to discredit what mainstream economists are doing. To the extent that they have interesting and constructive ideas, you can usually find examples of mainstream economists who are tackling the same issues and doing a better job. What makes a fringe economist? Apparently some are just born that way. My colleague Doug North, who lives in the office next to mine, is like this. Doug may indeed be the most successful fringe economist in the world (though "success" and "fringe" seem to be contradictory), and he has a Nobel prize to prove it. He has a disdain for mathematics, and seemed pretty suspicious of the invasion of his department by various macroeconomists and theorists, beginning six years ago. Other people grow into fringe economics, maybe out of necessity. One learns how to do economics in a particular way, a technological innovation in research methods comes along that destroys your human capital, and you are faced with two alternatives. Either you bear the costs of adopting the new technology, or you form your own support group and fight the adoption of the technology by others. Old-time Luddites and Saboteurs would understand the second approach well. Mathematics is of course here to stay in economics. Samuelson's Foundations of Economic Analysis was an early handbook for the application of mathematics to economic problems, and once Arrow, Debreu, and McKenzie (for you Rochester loyalists) had made their contributions, there was no turning back. The fringe, working outside the mainstream, has had issues with essentially all mainstream fields in economics, but internal conflict within fields has also lead to fringe movements of disenfranchised types. Internal squabbling has been far more prevalent among macroeconomists than among microeconomists (though I'm sure people can give me plenty of examples of groups of economists who hate each other). Macroeconomists had a hard time absorbing the new methodology that was first introduced in the early 1970s that included dynamic optimization tools from mathematics, and various elements of received micreconomic theory (general equilibrium theory and game theory primarily). One Luddite was James Tobin who, after making some nice contributions to our understanding of asset pricing and financial intermediation, chose to take the destructive approach with regard to the ideas of Lucas and friends. More interesting, in a way, are the economics professors who are totally convinced that people like Brad DeLong and yours truly are ignorant, unwashed types who don’t know anything about modern macroeconomics. Anyone who would rather dry his underwear in a frying pan than wear soiled undergarments can't be all bad. Now, how ignorant is Krugman? The question is: "relative to what?" Surely he knows more than a ferret, or an albatross (my wife taught The Rime of the Ancient Mariner yesterday, and we had a discussion about albatrosses over dinner, so I had this on my mind). On economic issues, he would certainly give our graduate students a run for their money, but in terms of modeling skills, I think our first-year graduate students would win hands-down. Krugman is apparently quite proud of this 1998 paper. This is something our first-year graduate students could do in 20 minutes on an exam. Nothing to be ashamed of, of course. Krugman wasn't shooting for publication with this little ditty. Does Krugman know more about macroeconomics than, say, Bob Lucas? I don't think so. Bob, at 73 years old, is still writing papers, giving academic seminars, and going to academic conferences. He is very much up on what is going on in the profession, he's receptive to new ideas, and he encourages younger members of the profession. Bob seems quite uninterested in earning a big income. He just loves economics. Krugman checked out of academic activities long ago, opting for highly-paid speaking engagements and NYT column-writing. But that's fine. We don't really expect him to be at the cutting edge of academic thought. The strange thing is that Krugman wants to characterize the people who think of him as less-than-up-to-speed on macroeconomic thought as "fringe." I haven't taken a poll, but my informal reading of opinion among New Keynesians, New Monetarists, Prescott followers, or whatever, who are also active researchers (have published a paper in a respectable economics journal in the last 3 years), is that Krugman's "fringe sect" is actually the majority of mainstream macroeconomists. For the record, I tend to think things through in terms of New Keynesian models, as in my old Japan paper, but often translate the results into IS-LM for simplicity. If that’s a crude, primitive approach, somebody should tell Mike Woodford. What Krugman does not understand is that Woodford's framework is not IS-LM. One of Woodford's brilliant marketing triumphs was to dress up New Keynesianism in the language of Old Keynesianism. There is an IS curve and a Phillips curve, and you drop the LM curve in favor of a Taylor rule. However, the underlying model is basically a Prescott real business cycle model with monopolistic competition. The sticky prices give you relative price distortions that make the model amenable to doing standard welfare economics. It's really not IS-LM at all, but if people like Krugman think it is, that's helpful for Woodford. What’s going on here? I believe that what we’re looking at is people who know their math, but don’t know what it means: they can grind through the equations of their models, but don’t have any feel for what the equations really imply. Confronted with informal discussion that’s grounded in models but not explicitly stated in terms of math, they’re totally baffled. And so they lash out. Now it's Krugman that is sounding like a grumpy fringie. The message here is a Luddite message. Beware of economists who use mathematics. They have spent too much time with their math books and haven't a clue about economics. The rhetoric is typical. You are supposed to picture sad (and calm) Krugman in his arm chair, musing over his frustrated critics who are busy frothing at the mouth in their hopeless confusion. There is nothing new about this, of course. We have lived with Luddites for a long time in the economics profession, and they are not going away. Coming from a Nobel-Prize-winner with a large audience, the message can of course be quite damaging. University administrators read the New York Times, and so do undergraduate students. Lazy scientists don't need encouragement. Students love it when they are told they really don't need to know anything technical. However, belief in that falsehood will not do them, or society, any good. 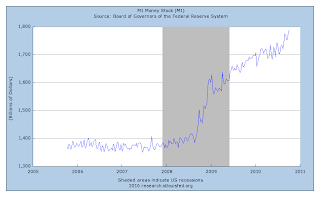 Is There a Central Bank Intervention Rosengren Doesn't Like? I feel like I am doing a series on speeches by Fed Presidents. I don't know why, but these things never fail to interest me. Here is Eric Rosengren, speaking to a group of New York forecasters about current Fed policy issues. Hiding in here is a good lesson for anyone who thinks that your graduate school education is an indoctrination. For example, some people seem to think that MIT (in the old days anyway) sends you off to the far left, and Chicago sends you off to the far right (again, in the old days). Eric Rosengren and I entered the PhD program at the University of Wisconsin-Madison in 1980, and we were both teaching assistants in Don Hester's undergraduate money and banking course. The funny thing is that one of the responsibilities of Don's TAs was to run a computer-simulated banking game. The students ran banks, and the TA played the role of central banker. Apparently Eric took this job very seriously, as this ended up being his chosen career. Another one of our classmates, who had shown up the previous year on campus was Jeff Lacker, now also a Fed President (Richmond). Eric and Jeff could not have more different ideas about how to run a central bank. While Eric is very much into intervention and guiding the economy, Jeff is very much into market solutions, and is highly skeptical of intervention. Obviously these guys are independent thinkers. In short, policymaking has been effective at stabilizing the economy, but the recovery remains far too weak to restore what we consider full employment with the speed I would like to see. Clearly, his primary focus is on the real side of the economy, not inflation (though more about that later), he thinks he knows how aggregate empoloyment should be behaving, and he thinks monetary policy can help in making it behave better than it is. To me, this does not suggest that the driver is structural change in the economy increasing job mismatches – although no doubt some of that exists – but instead I see here a widespread decline in demand across most industries. Eric's arguments are the usual ones coming from Old Keynesians, i.e. production and employment dropped across all sectors during the recession; sectoral reallocation is no more important and probably less important in the current recession than in other recessions; the currently low level of employment and high unemployment rate are due to "deficient demand." If this Econ-101 aggregate-demand-management vision of the world were correct, then the unemployment rate in Canada should be about 11.5%, instead of 8.1%, as it is now. What Eric and others are ignoring are the peculiarities of this recession related to the housing sector, which we have to trace back to the year 2000, and perhaps earlier. The incentive-problem-induced boom in housing construction from 2000 to 2006 distorted the allocation of resources in the U.S. economy, and the subsequent housing bust created a need to reverse that reallocation. Housing construction will not be recovering any time soon, and that is a key anomalous feature of the current recession - housing construction typically leads the recovery. What is surprising about Eric's views is that, given those views, it is likely that he was one of the architects of the Fed's purchase of more than $1 trillion in mortgage-backed securities (MBS). This is a sectoral intervention if there ever was one. If sectoral reallocation is unimportant in the current recession, why did the Fed need to buy MBS, in the process reallocating credit, and resources, to the housing sector? Why didn't the Fed just buy $1 trillion in long-term Treasuries instead, which would have at least been sector-neutral, in some sense. Note further that the Fed's MBS purchases worked against the sectoral reallocation that was taking place, and that needed to take place. Eric goes on to discuss policy options. Here, he starts by taking an approach that appears to be common currency in parts of the Federal Reserve System. A simple Taylor Rule calculation, shown in Figure 10, relates movements in the federal funds rate to deviations in inflation and unemployment from their targets. The far right section of the chart highlights that given the very low level of inflation and the very high level of the unemployment rate, the Fed would have continued to reduce the funds rate over the past two years, but for the zero lower bound. Figure 10 is a picture I have seen before. The idea is that you fit a Taylor rule to the data (presumably linear in this case). 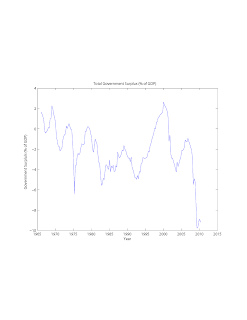 Out-of-sample, this Taylor rule predicts a nominal interest rate of about -6% or -7% currently. Then, the typical argument seems to be that, if the Fed were doing what it was doing before (which we all know was the "correct" policy), it is going to be constrained by the zero lower bound on nominal interest rates from doing the right thing, which justifies doing other stuff. 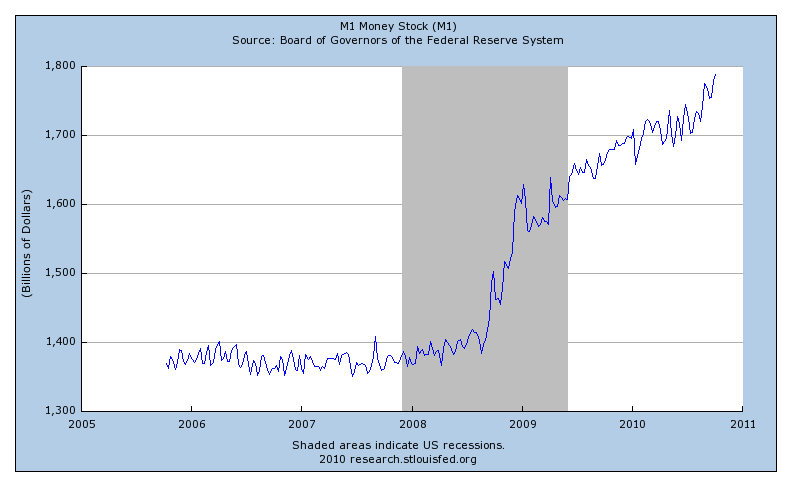 That other stuff includes quantitative easing (QE) - purchases of long-maturity Treasuries by the Fed. Now, implicit in this idea is that the Fed should be claiming property rights over both the unemployment rate and the inflation rate. 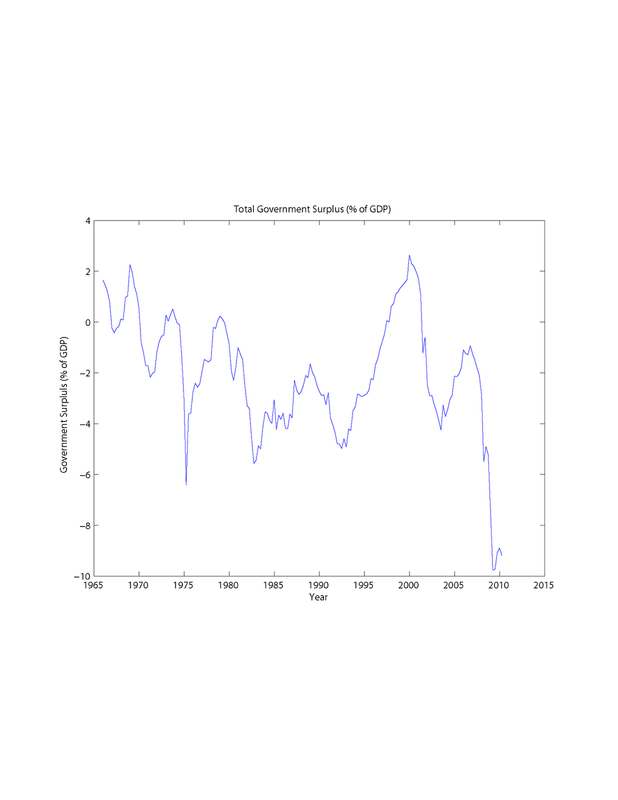 The Taylor rule policy that it was apparently pursuing in the past is claimed (in particular by John Taylor, see this) to have been a great success, witness the "Great Moderation," for example (the period after the 81/82 recession and before the financial crisis). Of course, if the Fed has property rights over the unemployment rate and the inflation rate, and the Taylor-rule policy was such a great success, what was the financial crisis and the current recession all about? Eric, and others at the Fed, want to claim that the financial crisis was a triumph of central banking, but if we take Eric's views seriously, this episode should be considered a disaster. I do not think that the Fed's behavior had much to do with the causes of the financial crisis. I know that some people think that low interest rates during Greenspan's tenure contributed to our financial problems, but I don't put much stock in those arguments. The danger in having the Fed claim too much credit for economic successes, particularly on the real side of the economy, and in attributing too much power to the Fed over real activity, is the property rights problem. Congress, and the public at large, come to believe that the Fed owns the real economy, and is responsible, not only for the real successes, but for the real failures as well. This is a dangerous threat to the Fed's independence. Now some concerns: While purchases of Treasury securities have the advantage of not directly “allocating credit” to a particular industry, they have the disadvantage of only indirectly affecting the private borrowing rates that more directly affect private investment spending. In addition, Treasury purchases raise for some a concern that the Fed intends to monetize the federal debt, using monetary policy to accommodate the financing of fiscal policy. I can assure you that we have no desire or intention whatsoever to do so. So, a QE program involves changing the structure of the outstanding debt of the consolidated governnment (Fed and Treasury). The Fed is swapping outside money for long Treasuries, which is literally monetizing the debt - shortening the average maturity of the debt, and making it more liquid. How can you say you have no intention of doing something you are literally doing? It is looking increasing likely, given the public statements of various Fed officials, that, barring some surprises in new data coming in, the FOMC will decide on some change in their strategy - likely some QE - at its next meeting. Likely the Keynesians and non-Keynesians can agree, based particularly on the inflation data, that more expansion is needed. In spite of what Eric thinks (i.e. the key risk is deflation), there is still inflation risk associated with the large quantity reserves in the system and the maturity structure of the Fed's balance sheet. This will be exacerbated by any further QE.